Better food can help us to become better people. When we eat good food, then our health and our mental capacity can improve. When we can cook better food, then we can be more healthy and happy. Our food can become our medicine. The Chinese wok can be a good tool in the kitchen. The Chinese wok is very useful. We can use it for the cooking of steamed vegetables and fried food that is more healthy, than the food that we cook inside of the boiling water or boiling oil. epSos.de did publish the helpful video about the cooking in the Chinese wok. This video can be a good help for the improvement of the personal cooking skills. The Chinese wok can reduce the amount of heat inside of the vegetables. The vitamins and the organic minerals can be preserved, when we can cook our food on mild heat. The Chinese wok is a very good tool for cooking on slow and mild heat. The round shape of the Chinese wok can help the heat to move to all parts of the food. The food can be more fresh, because we can reduce the amount of the boiling water and the hot oil in the Chinese wok. The boiling water can be at the bottom, while the rest of the food is inside of the steam that is more mild and friendly to the food that we cook. We can cook steamed vegetables that are much more tasty, when we cook then in the mild steam, inside of the Chinese wok. The different tools can help us to make the different things. The Chinese wok is a very good tool for cooking any type of steamed or fried food. If we want to cook the tasty soup, then we can use the cooking pot for boiling the soup. The Chinese wok is better for the food that we do not want to boil. There are advantages of cooking our food on the mild steam inside of the Chinese wok. The hot steam is more mild to the food, than the boiling water. The ingredients can be more fresh and we can use spices on the surface of the food, instead of boiling them. The Chinese wok can help us to cook better food. When we learn new and better things, then we can grow our personal potential in life. The best form of investment is the investment into the personal education that is useful in every day of our life. The cooing skills can be a very valuable investment. 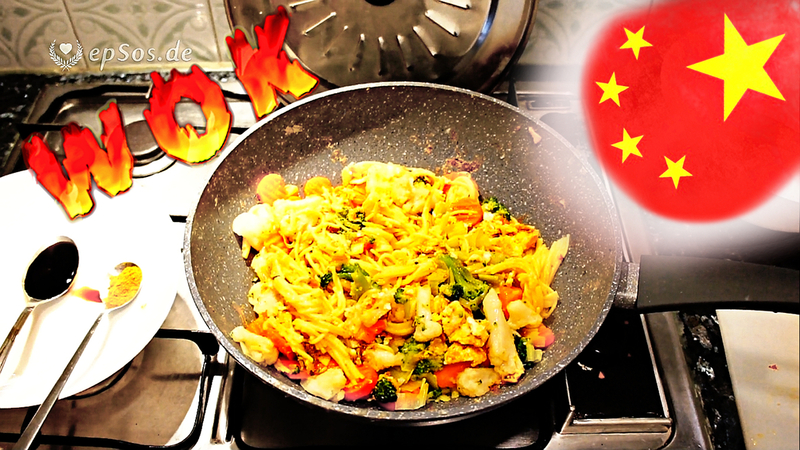 In the wonderful video epSos.de is teaching for how to cook steamed vegetable and noodles in the Chinese wok. The preparation steps are simple. The ingredients must be cooked separately. Then we mix them together. The spices are the last step in the process, because we want to preserve the beautiful flavor of the spices. The Chinese wok can improve the simplicity of cooking at home. The shape of the Chinese wok is perfect for the cooking of fried food, because the heat can move to all parts of the food. The tall walls of the Chinese wok do protect the oil from creating the oily disaster in the kitchen. Using the Chinese wok can create more options for more tasty food at home. We can be very happy about the Chinese wok in our kitchen. Enjoy the cooking of your own food at home !